We decided in comments to narrow it down to "Sylvenstein (dam), about 1 hour south of Munich in the Bavarian Alps"
The highlight (red marker) is on the Bavarian Alps (not the only mountains in Germany to be sure, but some of the most southern). The two stars joined by a red line represent Normandy in the north-west and Lyon in the south-east. But.. That is heading south east, towards Italy or Switzerland, as opposed to due east, to reach Germany (their supposed destination). The characters wanted to avoid Paris (it turns out it was heavily defended by 'the enemy' - but would probably have been expected by the characters to be unsafe to pass through even without that specific knowledge). So, if you're at Normandy, and wish to reach the mountains (anywhere) in Germany but avoiding Paris, would the logical path take you through Lyon (..then presumably Switzerland)? Even in the fictional journey from Normandy to the Bavarian Alps, there is no reason to avoid Paris without bestowing prescience on the hero, and if the hero were prescient he wouldn't have gone to Germany in the first instance. Moreover, the scriptwriters could have placed the helicopter in any location, Strasbourg for example. Is there anything about Lyon that would prompt a film director to pay homage to it? Even if it were an homage understood by insiders only? Yes. Lyon is a city that has provided the location for a many great films. The city also has an impressive list of notable residents. Any of these might provide the grounding for an homage or tribute. Beyond this (or some similar outré reason), there is no "logical path" between Normandy and Sylvenstein that situates Lyon as a way-point. Not the answer you're looking for? 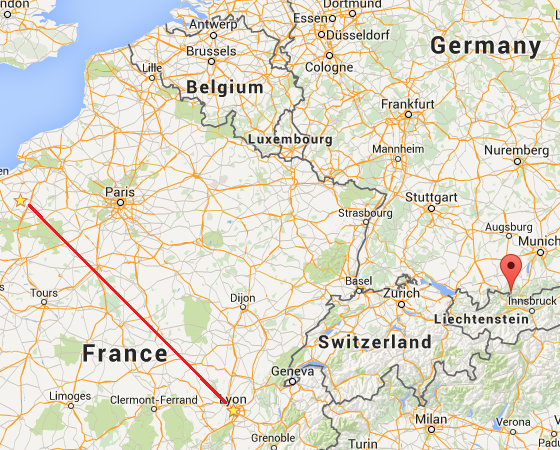 Browse other questions tagged france germany routes identify-this or ask your own question. What is the cheapest way to go from Poland to Lyon (France)? What is the cheapest way of getting from Lyon to Saint-Paul-de-Varax?